If you wish to make an apple pie from scratch, you must first create the universe. How easy is it to make apple pie? It makes you look like you are a complete whiz in the kitchen. And makes the kitchen smell absolutely wonderful. Apple pie makes people happy. 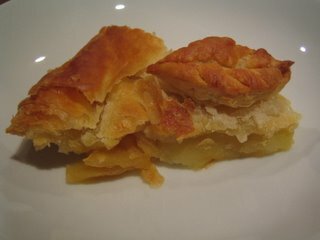 So many people have good memories of apple pie, some due to books and movies as well as Grandmothers and Aunties. There are many, many ways to make an apple pie, some more demanding than others, and there is a time and place in which it is appropriate to choose the harder route. But generally, as far as apple pie is concerned, I tend to choose the easy option! Slice peeled and cored apples into a pie plate. Tuck in cinnamon quills or cloves. Sprinkle over some sugar to your taste. Decorate to make it look even prettier. Cook at 180°c for 25 minutes. Enjoy and don't forget a cold slice makes a great breakfast! Hmm. Maybe I should try this. Nine easy steps and I get to be happy too! That's a win-win and it is summer after all. What apples do you recommend? Definately win-win. And I say that seriously. I am not sure at all about New Zealand apples. I know that in the UK there are cooking (bramley) and eating apples, but I am not sure the equivalents here. Rest assured I shall do some research and let you know!